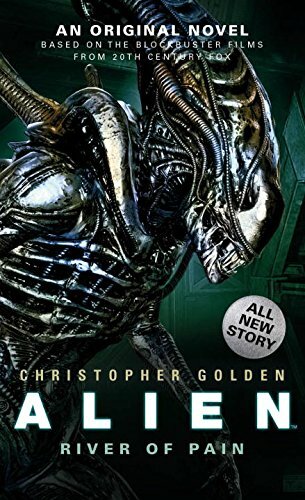 I thought Alien: River of Pain was a great book. The characters exhibit every conceivable noble approach in an attempt to save others and there are some that discount humans at the expense of science. And there are no robots mentioned until the very last pages of the book. Most notable in regards to the xenomorph/mutagen was that the resin secreted by them and the vomit that the xenomorph uses to subdue the hosts is cited many times. "The sticky, hardening resin that the demons secreted was everywhere." Alien: River of Pain, page 273. Later in River of Pain, the Onager was cited as a potential escape vehicle. "The colony had a spaceworthy excavator ship on hand to mine asteroids, should the need arise. The question was whether or not the Onager had been here on Acheron..."
Alien: River of Pain, page 242. The Onager is also shown on LV-223 in the Dark Horse Fire and Stone Prometheus comic, below. This is more than a century after Peter Weyland visited LV-223 during the events of Prometheus. Paradise Lost is also mentioned in River of Pain when Brackett thinks of the "ninth circle of Hell" on page 274 while looking down the elevator shaft. "The creature caught him by the hair and dragged him back, regurgitating a thick liquid into his face. Navarro choked and flailed but quickly became sluggish, and the alien kept dragging him toward the door. The second alien leapt onto Pvt. Konig just as the man's chest burst open and the newborn creature slithered out. The two monsters ignored each other." "Deep thanks to my editor, Steve Saffel, for watching my six, and to the entire team at Titan for their dedication to this new voyage into the Alien canon." Films' content certainly has the final verification on what is canon or not but it is great to see where the story is heading to in the novels. The xenomorph regurgitating fluid and the fluid raining off them seem to coalesce into the biomechanical aesthetic formations that we saw in Alien (Dallas above) and Aliens around the queen's hive under the processor that the Colonial Marines encountered (enhanced image below). The juggernaut interior below looks very similar so I can only assume the same technology (mutagen AI variation?) is used in the creation of each example. This aesthetic is all very similar to the Engineer's skin/suit on LV-223 and the xenomorphs seen on LV-426 and Fury 161, below. I think the Comics and Books are a interesting Read for Fans, i am not so convinced on them as Canon due to Errors in Continuity, but then Alien Covenant seems to not stick to a Coherent plan regarding Prometheus and the Franchise either. Which Raise Questions like SURELY the Company must have known much more than Alien/Aliens let on and... WHY has the company never been back (WELL at least) WHY do they pursue the Xenomorph on LV-426 when LV-223 is not considered a better option to obtain Biological Weapons and Technology of the Engineers. Regarding the Aesthetic and the Resin, going back to ALIEN we could see the Derelict and Xenomorph shared a Aesthetic, we latter see in ALIENS the Hive Shares a Aesthetic with the Derelict too. It appeared there HAD to be some connection.... which the Prequels Failed to really do much justice due to the difference in Aesthetics used in the Juggernaught. The Resin/Construction of some parts of the Derelict and Xenomorph Hives was always interesting, and the Secret Resin Explanation was always a bit FLAWED unless they Secret this SUBSTANCE that actually Grows like some kind of Bio-Mechanical Plant/Weed. Because if we Assume they Secret a Resign this would surely be like what.. Liquid Silicone before its Cured? Do the Xenomorphs then use this to create/carve the Structures like we would maybe with Plaster/Silicone but we use MOLDS to make different shapes. So the only Explanation would be the Resin is maybe Secreted and Molded by the Xenomorphs where this Substance then Grows like some Bio-Mechanical kind of Vine/Fungi. The Aesthetic of the Engineers Bio-Mechanical looking Suits is also connected to the Xenomorph to a degree Aesthetic wise, its maybe likely the Engineers either encountered a Organism and Re-Engineered it to be able to use its Atheistic to create those Bio-Mechanical Suits and their Ships.... or some Race/Ship had this connection that the Engineers Reverse Engineered. "It appeared there HAD to be some connection.... which the Prequels Failed to really do much justice due to the difference in Aesthetics used in the Juggernaught. The Resin/Construction of some parts of the Derelict and Xenomorph Hives was always interesting, and the Secret Resin Explanation was always a bit FLAWEDunless they Secret this SUBSTANCE that actually Grows like some kind of Bio-Mechanical Plant/Weed. Because if we Assume they Secret a Resign this would surely be like what.. Liquid Silicone before its Cured? Do the Xenomorphs then use this to create/carve the Structures like we would maybe with Plaster/Silicone but we use MOLDS to make different shapes." Correct BigDave...the mutagen technology grows in something like a biomechanical weed. In another novel, a black substance grows in a "smart" way and makes it's way to the surface of the planet and it doesn't seem to need a xenomorph to form it. The juggernaut in Alien: River of Pain was also described in great detail with components we haven't seen in film or in the novels. Great catch Ingeniero!I have yet to read the novel but is on my agenda.This video is all i really know about the novel thus far. Great video ninXeno426. The section of the novel that the narrator covers is perfect...they enter the ship and go to many levels. I highly recommend Alien: River of Pain. The novel touches so many xenomorph aspects that were not in the films. They eat...the slime falling off them coalesces into form...great stuff. Nice find! I just finished reading the Prometheus comic books and I didn't pick up on that. So, it's been awhile since I read River of Pain, but I can't remember if anybody leaves on the Onager? My favorite of the 3 would have to be Sea of Sorrows though followed by River of Pain then Out of the Shadows. All were enjoyable! The quote above is about as much detail as we get about the Onager in Alien: River of Pain...as far as I can remember. My favorite of the trilogy is Alien: Sea of Sorrows too. The city they find under the surface sounds very familiar. I have not read it yet... have to read some of the Novels.. Regarding the Derelict and Xenomorph indeed they shared a Aesthetic and HR Gigers Mural for ALIEN implies the Derelict is Aesthetically/Genetically related to the Xenomorph and Creates the Eggs. HR Giger also considered the Derelict Ship was GROWN! "HR Giger also considered the Derelict Ship was GROWN!" I believe that Giger's whole aesthetic looks as if each example was grown BigDave. This concept was also included the Alien novelization as well, below. "The alien ship conveyed the impression of having been grown rather than manufactured." Its kind of a idea i was going to eventually introduce in Prometheus Sequels... likely a Prometheus 4. This Mural indicated to me a Genetic/Synthetic Connection between the Ship and the Xenomorph, it indicated to me the Ship produced the Eggs... and indeed this Mural was to be placed over the Egg Chambers Segments that had Bio-Mechanical Pregnant like Bellies that HR Giger had said would produce the Eggs. I think we had to discus the Aesthetic Differences and Size between the Juggernaught and Derelict and look at HR Gigers Surreal World and ideas.. but bare in mind Prometheus! To me this shows there is some Symbiotic Relationship between the Humanoid Pilots who Self Sacrifice for the Xenomorph... via Ships that Produce the Eggs. Do these Humanoids Create this Technology? Why Self-Sacrifice... could they had created Mankind to replace them in the Self-Sacrifice? Is some other Race who being the ones behind the Technology and the Humanoid Race Serve a Function, are they Enslaved? do they have a Covenant that requires some Sacrifices? Are these Humanoids Created by some other Race who also Created the Ships? Or was they a Race this other Race encountered and Enslaved or a Combination, a Race they encountered and Re-Engineered as Sacrificial Slaves? I felt that exploration of something like this would fit with Prometheus but also allow for something more HP Lovecratian and HR Giger to be explored. But the PATH of Alien Covenant has maybe limited such a thing to be explored. "Is some other Race who being the ones behind the Technology and the Humanoid Race Serve a Function, are they Enslaved? do they have a Covenant that requires some Sacrifices?" There is something close to your question above in Alien: Covenant Origins BigDave....on page 1. "Dying in their sleep would not have been so bad. Dying of old age, or an inability to reproduce, or even of disease would have been tolerable." It was never made clear who it was in the book but another race was being overwhelmed and torn apart by "things". The listed ailments that were tolerable in regards to mortality left out what they currently faced, below. "Bodies were ripped apart, exploded, sundered, until dismembered skeletons began to pile up against the sides of buildings like white foam from a wave. A tsunami of blood ran down first one street, then another......The shapes-the things that roved and raged and ravaged among them-were imbued with an implacable urge to kill." It was never clear if this was discussing the Engineers or a xenomorph wave but both are feasible with what we have seen in Aliens (xenomorph wave) and Alien: Covenant (Engineer streets) but "skeletons" tends towards those devoured on Planet 4 when David arrived. Was the Engineer sacrifice an attempt to stop this punishment from someone else similar to what happened to those described in the opening of Alien: Covenant Origins? We still don't know. There were sections of the above video that included things I hadn't seen (or missed) before. There were many Engineers there to witness the event shown in the opening of Prometheus. I enhanced the below photos to show the scores of Engineers witnessing the sacrificial Engineer and the elders from the opposing cliff under the large Engineer ship. It could be a hundred or more across the clifftop. I missed this before and realize that this is a deleted scene but it is very interesting to see so many there for the event. All of the Engineers packed back into the ship and headed for the clouds before the swarm erupted from the sacrificial Engineer. I have yet to read the Book... i do recall something about this was a DREAM from the CEO of Yutani. Could it apply to the Engineers? Its sounds like a description of the Poster to Alien Covenant which had all those Engineers and Xenomorphs on it.. but who knows.. Regarding the Many Engineers.... Good Catch, i have NEVER noticed that before... i had only ever paid attention to the 8 Elders in that scene.... But indeed it shows us that MANY more were Watching Beneath the Pebble Ship. This certainly opens up something to discus..